This redback salamander spends much of its time under logs at this time of year. Females lay eggs there and guard them until small salamanders hatch. If cornered by a predator, a redback salamander can get away by releasing its own wriggling tail to distract the predator – a move sometimes described as self-amputation. Then it grows a new tail. Nearly everyone loves to spot wildlife in the local area. Now you can check the Westborough Community Land Trust’s new “Sightings” page on its web site to find out what other people have seen recently in the Westborough area. Go to www.westboroughlandtrust.org and click on Sightings in the list on the left. You can also report your own sightings of wild animals (including insects – think butterflies) and plants in your back yard, on the trails in town, or anywhere else by sending email to sightings@westboroughlandtrust.org. Photos are welcome. Track the signs of spring! The sightings page offers fun and information for all. Now that most of our snow has melted and the ground is bare, many of the animals that we think of as “ours” are coming out or returning from where they have spent the winter. One native animal that most of us probably won’t see but can enjoy knowing about is the redback salamander (Plethodon cinereus). This creature of the forest floor is the most common and abundant salamander in Massachusetts. The best place to find redback salamanders is under a rotting log or stump in the woods. They have no lungs so they need to stay moist to absorb oxygen and give off carbon dioxide through their skin. (In this way they differ from the spotted salamanders and blue-spotted salamanders that visit vernal pools at this time of year, which breathe with lungs.) Redback salamanders live their lives in dark, damp places, away from drying sunlight – in underground tunnels, under rocks and decaying logs, inside old stumps, and under the leaf litter in the woods. They’re active at night, or sometimes during the day when it’s rainy. Redback salamanders come to the surface at this time of year. They do not survive freezing (unlike some other local amphibians, such as wood frogs and spring peepers). They spend the winter far enough underground to avoid freezing temperatures – sometimes as deep as 3 feet. They especially like the decaying roots systems of white oaks (Quercus alba). As cold-blooded animals, they also retreat underground to escape summer’s heat. If you happen to find one (or more) under a log, you may think you’re looking at a worm as it wriggles away. Redback salamanders are long and thin, with a narrow head and small legs. Adults are 2 - 4 inches long, about the length of a white-pine needle. Most redback salamanders match the description in their name. They’re dark with a broad red stripe down their back. This stripe may serve as a warning of the distasteful substance made by glands along their back and tail. But some rebacks lack the red stripe, although they are still distasteful to predators. These individuals are sometimes are called leadback salamanders, due to their leaden gray-blue color. Rarely, redback salamanders are all red. 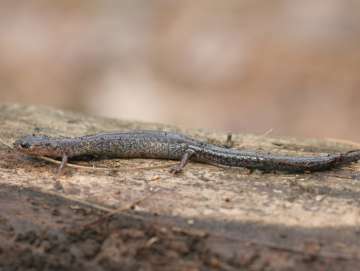 This “leadback” salamander, named for its leaden gray-blue color, is a variety of redback without a red stripe down its back. Notice that the salamander is about the same length as the white-pine needle beneath it, or about 4 inches. If you turn over a log, don’t forget to put it back the way you found it. It may be home or shelter for redback salamanders or other creatures. Redback salamanders are quite territorial. They mark their territories by rubbing their scent (from scent glands in their skin) and leaving their droppings on it. Spring is the mating season for many animals, but not for these salamanders. Redback salamanders mate in the fall, but the females don’t lay eggs until the spring. They deposit their eggs in batches of about 8 in underground holes or under rotting logs. The female then coils herself around the eggs and guards them for 6-8 weeks. Small but fully formed salamanders hatch in mid-June to mid-July and then stay with the female for 1-3 weeks. In dry periods during the summer, adult redback salamanders may allow their own young to come back into their territories to forage for food. The adults don’t chase them away, as they do with unrelated salamanders. Redback salamanders are able to recognize their own kin, probably by the scent of skin secretions. They may also recognize neighbors. What do these salamanders eat? They prey on insects, beetles, spiders, ants, termites, snails, earthworms, and even other salamanders, including their own kind. Collectively, they help to control the numbers of insects in a forest. And who eats redback salamanders? They are prey especially for shrews (mouse-like creatures which, like the salamanders, are active at night and spend their lives in underground tunnels) and ring-necked snakes. Other predators include birds that forage in leaf litter, such as robins and blue jays, and burrowing animals such as chipmunks and skunks, as well as other snakes. To defend themselves when a predator approaches, redbacks may freeze in place to avoid notice, as many other animals do. Or they may flee, disappearing into the leaf litter or holes or crevices. They may also stand their ground, coiled with back arched and tail waving toward the predator. If cornered, redback salamanders have a dramatic but drastic trick to play on a predator: they can shed their tail, which will keep moving on its own on the ground. While the predator focuses on the wiggling tail, the salamander gets away. How does a redback give up its own tail? The muscles between the bones in its backbone contract to bring about this sacrifice, sometimes described as self-amputation. Afterwards, the red-backed salamander grows a new tail, which looks somewhat different. We humans can’t grow new body parts, but most salamanders can regenerate their tail if a predator bites it off. Only some kinds of salamanders can actually cause their own tails to come off, though. If you’re tempted to “clean up” the woods on your property by getting rid of logs, stumps, and leaves, think twice – these are places where salamanders live and hunt, along with other creatures of the forest floor. 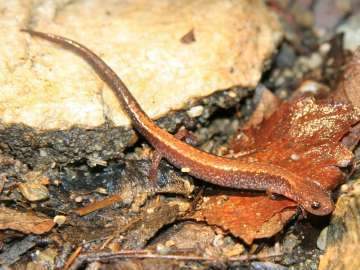 Redback salamanders need forests with relatively deep leaf litter and scattered logs and stumps for shelter. Mature forests are best. Acid rain can be a problem for redback salamanders and others. Their delicate skin readily absorbs substances from the environment. Massachusetts has about a dozen kinds of salamander, but the southeastern U.S. is one of the best places in the world for salamanders, with more than 75 different kinds. The glaciers that covered New England 10,000-15,000 years ago did not reach that far south, so many kinds of salamanders were preserved there. As we welcome the melting snows and lengthening days (and daylight savings time) of March, think of the diversity of unseen creatures at home on the forest floor. Enjoy thoughts of redback and leadback salamanders living under logs, spotted salamanders and blue-spotted salamanders visiting vernal pools to breed, and red-spotted newts swimming in our streams.